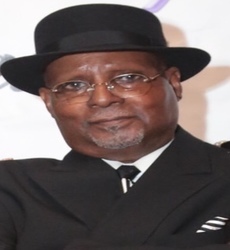 Harry Clark Epps, born on October 11, 1944 to the late Lillian Epps in Red Bank, NJ, departed his earthly life on November 5, 2018 surrounded by his loving family. He grew up in Cliffwood, NJ, where he attended public schools. Harry was the only 14 year old with a mustache and secured the name "Oilcan Harry." Harry began his professional career at Marlboro Psychiatric Hospital in 1964 as a food service worker. Harry was promoted to cook then an (ITI) Institution Trade Instructor. Harry joined the Army National Guard in 1975 with the 2nd Battalion 114th Infantry, Freehold, and was promoted to Staff Sergeant. While enlisted with the National Guard, he obtained his High School Diploma from Matawan Regional High School. Harry was Honorably Discharged in 1991. Harry was transferred to Jamesburg Training School for Boys where he was promoted to Assistant Food Service Supervisor. Harry then transferred to Northern State Prison where he finished his career as as Assistant Supervisor for Regional Food Services Operations and retired in 2002. Harry was a devoted father, brother, grandfather, uncle and friend. Harry truly bettered the lives of everyone he knew and showed kindness, compassion and just the right amount of sternness when needed. Harry enjoyed spending his free time with family, watching the Knicks and Mets, painting ceramic clowns and was a voracious reader of African American authors. Harry kept on top of politics as he loved to have discussions regarding current events. Harry was someone you could count on to be honest with you, even when you didn't want to hear it. Harry was strong and someone who will be loved and deeply missed by all who had the pleasure of knowing him, especially his work family at Northern State Prison. Harry was predeceased by his brother Arthur Epps, mother Lillian Epps and special aunt Mildred Hughes. Harry is survived by his loving daughters Patrice Cooper, Neptune, NJ, Althena Epps, Long Branch, NJ and Tasha Brown, Como, NC; beautiful grandchildren Ta'Tyana Snelling, Ta'Niya Mitchell and Tahj Clark Mitchell-Epps, Long Branch, NJ; brother Terry Epps, Sr., Asbury Park, NJ; ex-wife and good friend, Priscilla Epps, Como, NC; loving nephews, nieces, cousins and his grand pup Juicy.